you know the enemy e75 deserved a better team when he does all the damage, and a cluster of his team composed by a low health jagtiger, a rhmetalborsig, a full health t28 all get taken out by one IS. (me) and I took about 30 seconds flat. 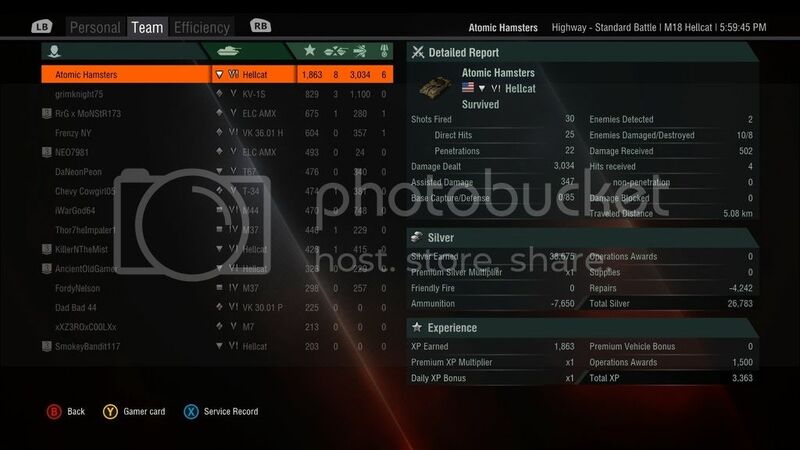 all he had against him was an e50 and me. I had no ap left and I had to finish him with H.E. after the E-50 charged and they both put each other on low health and were circling. he got 10 more xp than me. 1390 me and 1400 him. had to commend him on that game. Halfway though this match it was 8 against 3 in favor of the reds. When I say 8 against 3, I mean a fool in a Luchs that did nothing but hide next to arty and then foolishly charged toward the enemy to get himself killed in 0.3 seconds, that crummy french arty that didn't do much, and me in my Hetzer...so it was really just me. Call me cocky, but I won't care. 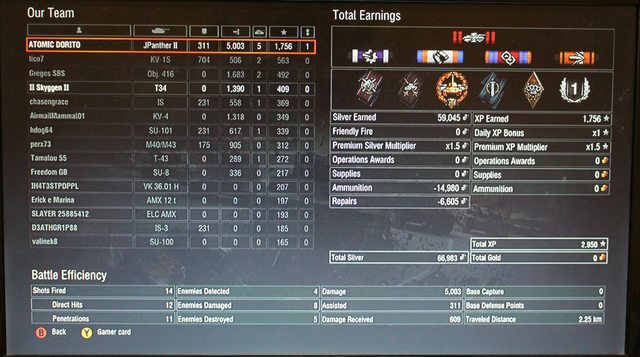 you know you deserve a better team when.... a fail platooning tier 4 pz. 38 na does more damage than a friendly t30 and a tortoise do combined. Been there, done that. I'll have to admit that I have been unlucky enough to be one of the bottom guys with goose eggs every now and then. Had one last night where I just had horrible luck in my Proto. Just ended up running into the wrong reds that I wasn't able to get a good shot on and after bouncing every shot i ended up being taken out by arty. At least those games are rare. It just feels so much better winning when you know you helped achieve it. The high scoreboard losses just leave that empty feeling. ...and then they feel they accomplished something. AI get these in my Jagdtiger all the time; sometimes I luck out and get an ally to watch my back. But what usually happens anyway is that I do 4000+ damage with my buddy and then get swarmed by 7+ tanks as both flanks fold like napkins against a fire hose. I have gotten a few good friends and regular platoon mates; one battle in monument valley me and Fedinand parked on a ridge and took out 6 tanks between us . . . then four mediums blasted though the other flank took out arty and us then turned around to hold off our 'assault' team who seemed to think that four tier nine mediums were no big threat as they sat on our cap zone spotting while their arty tore everyone a new one. 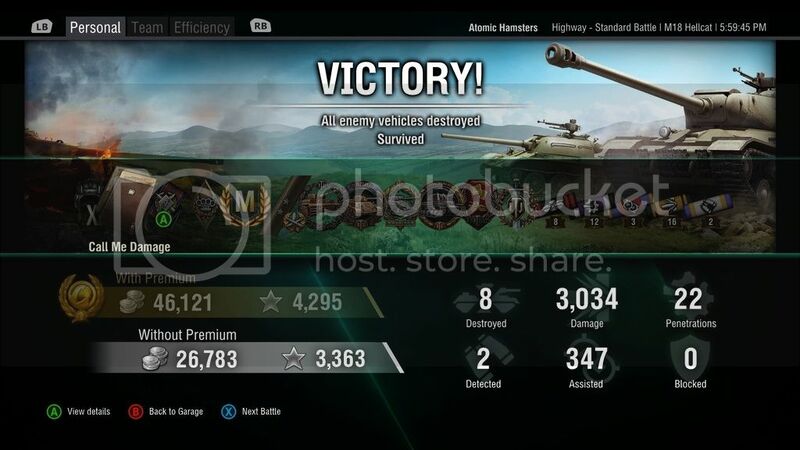 The part that gets me was when one of them complained that arty sucked for not holding the flag and then wined about the 'camping losers' (me an Ferdi) getting top placement on the results. You know you deserve a better team when you have FOUR teammates at the enemy base and they allow a SINGLE ENEMY to capture the friendly base......WHAT THE HELL IS WRONG WITH THESE PEOPLE?!?! Winning versus Kills. I've had long discussions with a friend and he thinks some people just what kills. I think its more psychological. Some just don't have strategic awareness. They see red and just want to get them. They don't see how red can win . . . but be dying. Personally I think they should make it easier to cap the base, force people to think strategically instead of tactically. IE; red vs blue as apposed to tank versus tank. Edited by Ajax Torbin, 24 June 2015 - 01:05 AM. 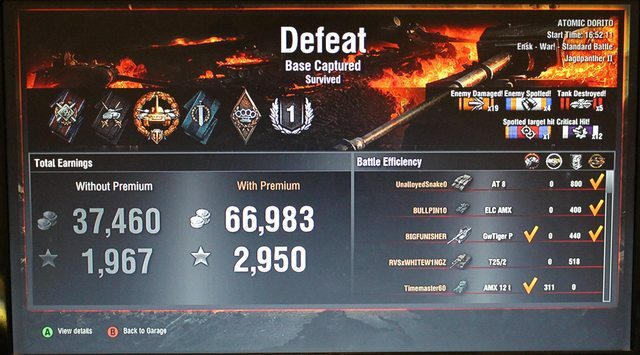 ...when you do 3000+more damage than anyone on your team and it could have easily been more if they had not capped out. Frustrating but often a really enjoyable game. Enjoyable but often a really frustrating game. "Don't try to be the hero. Try to win!" Me...heck....it happens all too often!!!!! You are in a tier VII battle on Pacific Island and your top tier player is in a T-29 sitting on the beach behind a hill shooting at the ships while less than 20 meters away on the other side of the hill there are 3 reds massacring the rest of your team. Then when he gets bored of shooting at the ships, he meanders up the beach oblivious to the three reds shooting him from the rear.